Tune in to Tom Gresham’s Gun Talk Radio this Sunday, May 23rd. Tom has an all-star line-up for Sunday’s broadcast, leading off with Texas Governor Rick Perry. Gov. 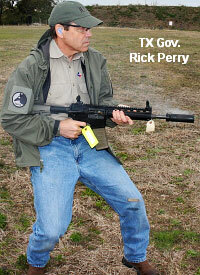 Perry talks about guns, freedom, and using his own carry pistol to fend off a coyote attack. U.S. Congressman Brad Ellsworth of Indiana also joins Gresham to discuss an amendment added to the National Defense Authorization Bill that would prohibit the U.S. military from destroying brass cartridge cases. Some base commanders have allowed this “once-fired” brass to be sold as scrap metal, which results in less revenue for the Department of Defense. It also eliminates millions of reloadable cartridge cases which should be sold through legal channels — something that can help with the brass shortages law recreational and competitive shooters have experienced recently. Gabe Bailey, FNH USA Marketing Director for Combat Rifle and Technical Support, will also visit Gun Talk Radio this Sunday. He will discuss the SCAR weapon system, which recently received final “Milestone C” approval for deployment to U.S. SOCOM troops. In its 15th year of national syndication, Tom Gresham’s Gun Talk Radio runs on 94 stations, plus SIRIUS XM Satellite Radio. All Gun Talk shows can be downloaded as podcasts through Apple iTunes or at Gun Talk Archives. Share the post "Hot Topics on Gun Talk Radio This Sunday"